Thank You Notes for Teacher: Sweet messages and inspirational words worthy of being put on a greeting card – take ideas from this post to write your own little note to say Thank You to your favorite teacher. Scribble out a cute quote on a piece of paper and leave it on her desk. Everyone can write a thank you note on Teacher’s Day. But if you think that you have a teacher who is special, pick a random day to show your gratitude. This is not about being a geek or being a teacher’s pet. It is about showing appreciation for the way someone selflessly works hard to help students shine out as brilliant individuals. Whether as teachers in school or professors in college, all teachers love it when their students look up to them and like the way they teach. 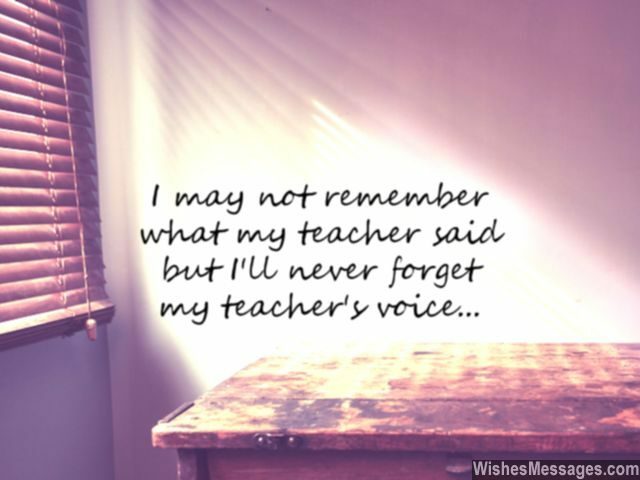 1) I may not remember what my teacher said but I’ll never forget my teacher’s voice. 2) Technology has made it easier for students to learn with devices new, but nothing can come close to the experience of being taught by an inspirational teacher like you. Thank you. 3) It is easy to take you for granted but it is difficult to forget your inspirational words. It is easy to misbehave in class but it is difficult to overlook your motivational advice. It is easy to spot annoyance in your behavior but it is difficult to realize the patience you have while dealing with us. Thanks for overlooking our EASY’s and never forgetting to do your DIFFICULT’s. 4) Dear teacher, thanks for not making us learn the way you wanted to teach, but teaching us the way we wanted to learn. 5) Right now I am doing exactly what you have always taught me to do when someone does something nice for you – say thank you. Thank you for making me what I am. 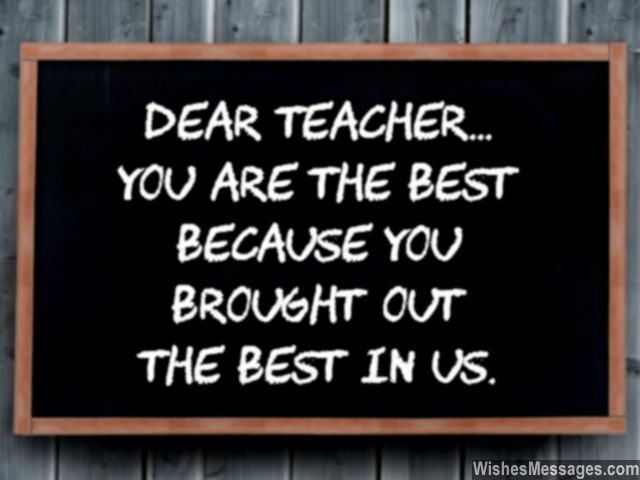 6) Dear teacher… you are the best because you brought out the best in us. 7) Classrooms can survive without iPads and computers, but never without inspirational teachers. Thank you for being the irreplaceable teacher that you are. 8) The loving ways of teachers like you is the difference between teaching and educating. Thanks for teaching us, educating us and empowering us. 9) Instead of leading us by holding our hands, you asked us to walk ahead while you caringly observed from behind. Thanks. 10) Ordinary teachers teach their students to succeed. Great teachers teach their students to convert their failures into success. 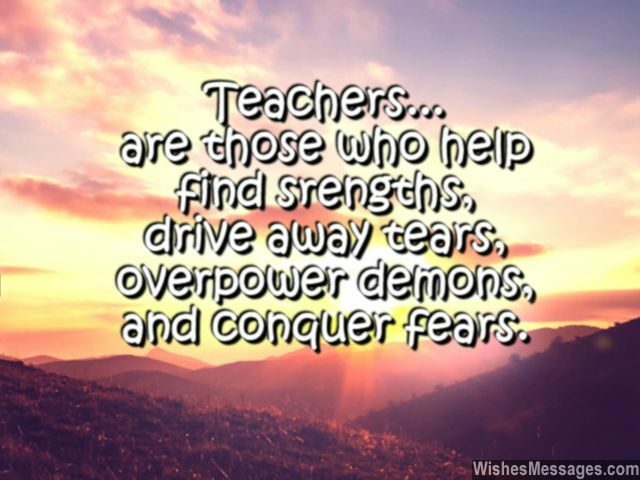 11) Teachers are those who help find strengths, drive away tears, overpower demons and conquer fears. 12) The future of mankind lies not in the hands of new technological inventions and scientific breakthroughs. It lies in the hands of ambitious teachers like you… because that’s where it all starts from. Thank you. 13) My mother has always been a little jealous of you because I listen to your advice over hers. But I know that deep down in her heart, she is actually very thankful. Thank you. 14) It never felt like you taught to earn a wage – it always felt like you taught to make a difference in our lives. Thank you. 15) We know that teaching can sometimes be thankless, today we want to thank you for giving us an education so priceless. Thanks. 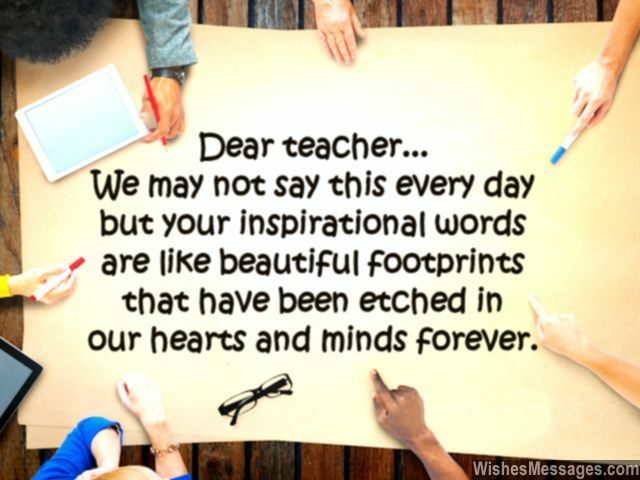 16) Dear teacher… we may not say this every day but your inspirational words are like beautiful footprints that have been etched in our hearts and minds forever. Thank you. 17) A lot of my life’s biggest decisions take birth from something simple but profound – the inspirational words of a teacher like you. 18) I don’t owe my professional success to my destiny, courage, luck, belief, confidence or fortune. I owe it to a wonderful teacher like you. Thank you. 19) We may not say it out to you aloud, but you make a beautiful impact on our lives without a doubt. We may sometimes behave annoyingly, but deep down in our hearts we know that you care for us lovingly. Thank you. 20) Dear teacher… you deserve to be the principle of our school because you have taught us the right principles of life. Thanks you. 21) An apple a day may keep a doctor away. 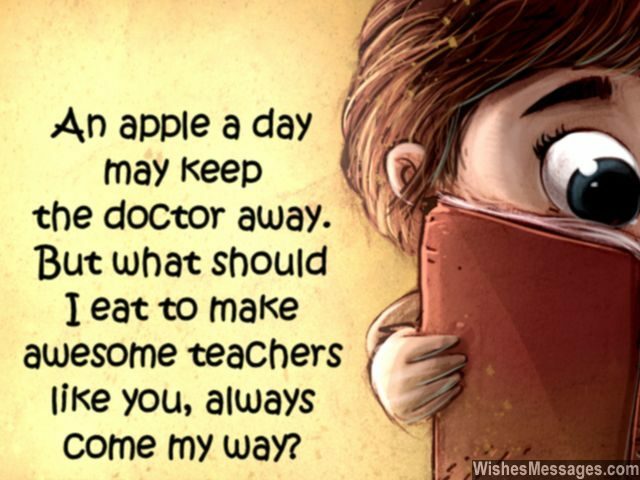 But what should I eat to make awesome teachers like you always come my way? 22) Only a teacher like you could make school tolerable, math likable and goals achievable. Thank you. 23) Dear teacher… after my mom and dad, you are the second parent figure in my life. Thanks for all the advice that pulled me out of my teenage strife. 24) Nothing can come close to the inspirational presence of a teacher like you in a student’s journey. You have no idea how important a role you play in shaping for a student, a brilliant destiny. Thank you. 25) The problem with having awesome teachers like you, is that you want the same ones to teach you in college too. Thanks. 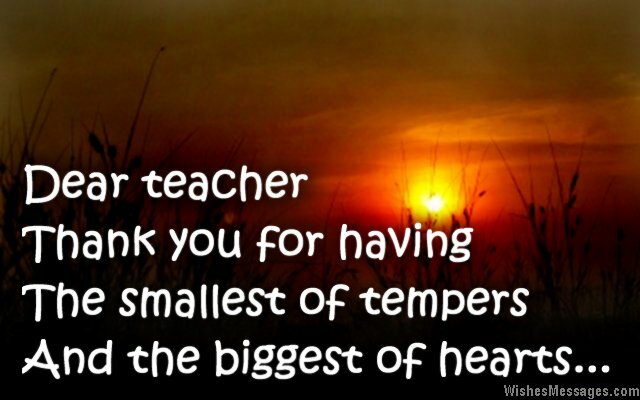 26) Dear teacher… thank you for having the smallest of tempers and the biggest of hearts. 27) We hate to wake up early in the morning and we hate waiting for the school bus. We hate homework and we hate detention. But all this is worth it because we love being taught by a teacher like you. Thank you. 28) Ordinary teachers teach their students to be good human beings by asking them to read inspirational books. Great teachers like you teach their students to be good human beings by being an inspiration themselves. Thank you. 29) Dear teacher, thanks for going out of your way and teaching us life’s lessons which we would have never learnt from textbooks and reference books. 30) Throughout the year you helped us get rid of all our academic fears except one – next year what will we do, without a teacher like you? Thank you. 31) Dear teacher… Wikipedia is jealous to bits, because I take your word more seriously than its. 32) Your compliments and encouragement have always been important to me. But your punishments and criticism have been more important because they have made me what I am today. Thank you. 33) There are two types of teachers, one who teach their students what the syllabus dictates and the other, who go beyond the coursework to teach their students things that life dictates. Thank you for being the latter. 34) Creativity, imagination and originality – the things you have cultivated in me are not quantifiable or measurable right now. But I am sure that their contribution in my life will be way more than just measurable. Thank you. 35) My classmates look up to famous actors, athletes, businessmen and leaders. I just look up to you… my teacher. Thank you being a true idol. 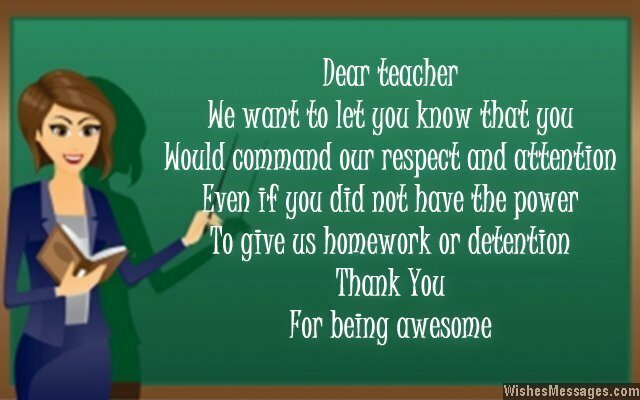 36) Dear teacher, we want to let you know that you would command our respect and attention, even if you did not have the power to give us homework or detention. Thanks for being awesome. 37) Since you selflessly teach us throughout the year, we don’t think it’s fair that we show gratitude just on Teacher’s Day. Here’s a random thank you for tolerating us all year round. 38) Dear teacher… when our young minds were impressionable, you left the perfect mark of quality on them. Thanks. 39) Schools, colleges and universities don’t achieve acclaim because of their historical buildings, heavy funding or celebrity alumni. They become great because they have outstanding faculty like you. Thank you. 40) Instead of just appreciating and complimenting my efforts in school, you set the bar higher and pushed me to do better in life as well. Thanks.